^ Official Web Site of the Suez Canal Authority. ^ Constantinople Convention of the Suez Canal of 2 March 1888 still in force and specifically maintained in Nasser's Nationalisation Act. ^ Encyclopaedia Britannica, 11th edition, s.v. 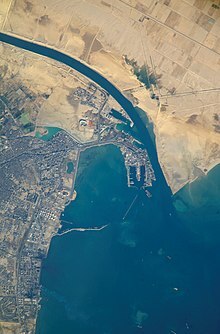 "Suez Canal" 互联网档案馆的存檔，存档日期2011-07-21.. Retrieved 8 August 2008. ^ Hess, Richard S. Rev. of Israel in Egypt: The Evidence for the Authenticity of the Exodus Tradition, by James K. Hoffmeier. The Denver Journal 1 (1 January 1998). Retrieved 14 May 2008. ^ Hassan, F. A. & Tassie, G. J. Site location and history (2003). Kafr Hassan Dawood On-Line, Egyptian Cultural Heritage Organization. Retrieved 8 August 2008. ^ （西班牙文） Martínez Babon, Javier. "Consideraciones sobre la Marinay la Guerra durante el Egipto Faraónico" 互联网档案馆的存檔，存档日期2012-02-01.. Retrieved 14 May 2008. ^ Jona Lendering. Darius' Suez Inscriptions. Livius.org. [24 August 2011]. ^ Salt-Corroded Tunnel Undergoes Major Renovation. Kajima.co.jp. [24 August 2011].